Finally it's arrived. This is the most excited I have ever been in the build up to a winter. Not only is there the real possibility of seeing not just one but three Britons standing on a Winter Olympic podium for the first time, in Sochi, this coming February, there are also huge dumps of snow being reported all over the Alps. And to top it off, Ski Sunday will have two episodes before Christmas from Val d'Isere - this Sunday and 22 December - on top of five during January in the build-up to the Winter Games in Russia. In this week's first programme, Graham Bell and I are in France for the men's giant slalom. 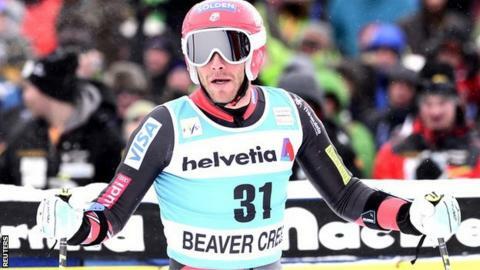 American Bode Miller signalled his return from an 18-month absence with a podium finish in the Beaver Creek giant slalom last weekend. Can he repeat the feat - or go one better - in Val d'Isere this weekend? Or will Ted Ligety continue his dominance? We'll also have an interview with snowboarding superstar Shaun White. I was privileged to go and see him, watch him training and interview him over the summer ahead of the Winter Olympic season. It's a revealing interview in which the two-time Olympic champion admitted to feeling depressed after his first win in Turin in 2006. He also discusses why he feels his will to win is sometimes frowned upon by his fellow riders and talks about the new love in his life - his band Bad Things. In this weekend's edition of Ski Sunday we'll hear from British Sochi prospect Billy Morgan, who will be competing in snowboard slopestyle, a discipline which will be making its Winter Olympic debut. In addition, we'll be looking at British Sochi prospect Billy Morgan, who will compete against White in snowboard slopestyle, which will be making its Winter Olympic debut in February. It has been an eventful few months. As well as chasing the biggest winter sports names for interviews, I went to enjoy some alpine sport during the last Southern Hemisphere winter. It was one of the most spectacular and memorable trips I have ever been on. Having married a Kiwi, I was exported to New Zealand seven years ago and so have been following winter north and south for the last 14 seasons. In that time I've been lucky enough to explore New Zealand's unique alpine culture - and while the resorts will never match Canada for snowfall or Europe for kilometres of piste, there are plenty of things to celebrate about 'Skiwi' culture. Back in September, I got the chance to meet up with a crew of friends who had put a trip together in the build-up to the Burton High Fives event based in Wanaka, where Kelly Clark, Scotty Lago, Peetu Piiroinen and Gretchen Bleiler were competing with one eye on Sochi. The plan was pretty simple: rent a couple of camper vans and drive around the South Island exploring the link between action sports and the Olympics. The trip turned out to be a journey in every sense of the word as we explored earthquake-ravaged Christchurch and visited Kaikoura, where the Southern Alps plunge into the Pacific Ocean - creating nirvana for surfers and snowboarders alike. The winter Olympics in Russia is now under three months away and one Southampton snowboarder has medals firmly in sight. But the highlight of the trip for me was somewhat unexpected. Having experienced Kaikoura at its most stunning, I was resigned to the idea that the Southern Alps would deliver their standard fare of difficult access, lo-fi infrastructure and challenging conditions. But the moral of this story is that low expectations always bring pleasant surprises and so it was with the Clubfield Broken River. Clubfields, if you've never come across them before, are a uniquely New Zealand concept. They are essentially public ski fields run by a team of volunteers who receive free lift passes and accommodation in return for their time. These workers enable the fields to open to the paying public, who in turn fund the upkeep of the club. We only had a day in Broken River and to be fair such a venue can, like anywhere, provide epic conditions. But what struck me in Broken River was that in a winter where we are going to be focusing on the pinnacle of our sports in terms of athletes and events, it's good to start on a mountain where things are so basic, just to remind you what makes skiing and snowboarding so much fun. Ski Sunday is on BBC Two at 17:55 GMT on Sunday 15 December.